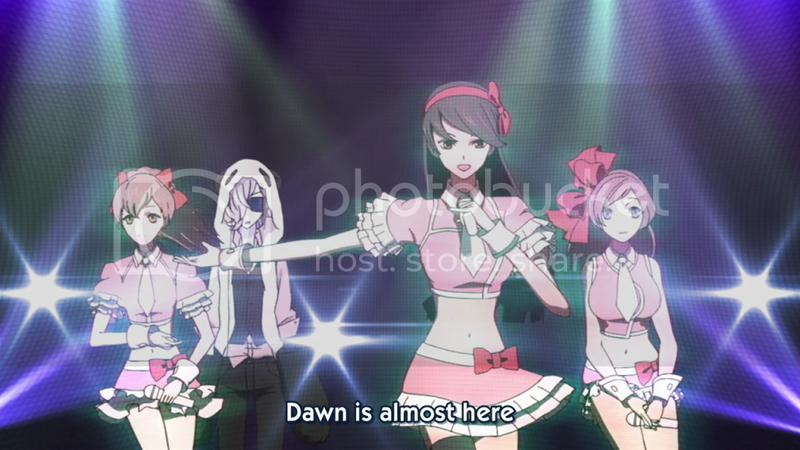 The way this idol moves reminds me of the Suzumiya Haruhi no Yuutsu opening. This episode is a lot better than the first, but still not good enough to return the show to my good graces. This episode definitely has more pace and is considerably less boring compared to its predecessor. For now I'm getting the earliest releases because I don't care much for quality of subbing. If I do decide to archive it, I will likely pick up Doki or Commie's releases because they are more tactfully done. This episode begins with Yuuki and Inga waiting in a very, very long line up to purchase a new "song" for a Dol-pli. These are glasses that allow the user to load said "song" and see a 3D holographic image of an idol singing a song. These "songs" can be purchased mostly on the software black market. The backstory of why such harmless media is blacklisted is not clear to me. However, current Japanese regulations regard these songs and Dol-plies as propaganda. Their distribution is very tightly controlled forcing people to purchase from the black market. The contrast of futuristic technology and archaic thinking is in line with the first episode. A notable banned idol group titled Yonagahime is mentioned and the conversation is quickly hushed, as though the walls of the back alley buildings have ears. Aaro: I'm pretty sure that the song for Dol-pli wasn't really being sold on the black market, and Yuuki's friend wasn't a black market software dealer (he just didn't some illegal things). For one thing, that line was pretty long and conspicuous for it to be the black market. What I'm assuming is that buying hard copies of the songs was one way to attempt to circumvent the fact that any data uploaded to the Internet would be policed, making it very hard to get through censors sometimes (this episode highlighted a post-war super-policed Japan). The reason this "harmless media" is blacklisted is due to propaganda; songs containing a secret message would be very harmful and the current post-war government has decided to take a rather hard-handed approach. Our next murder is delivered. We then cut to an apparently irrelevant scene where a woman pays a taxi driver to pick up her luggage from a residential address. Being an unlicensed driver and therefore a shady character, his curiosity tempts him to open the luggage in hopes of finding valuables he can cash in on. Instead he finds the corpse of a publicly known businesswoman. The victim, Osada Hisako, used to be at the head of the pop music industry during the war and is currently a wealthy investor. The suitcase was left with the guard at the residence by an unknown, undescribed man. Koyama explains the murder to Kaisho Rinroku who sets up a press story. A cross dressing restaurant proprietor, Aramaki, is suspected of the murder and being the woman who leads the taxi drier to the suitcase with the body. He pursued her with stalking interest and disposed of her when she resisted. Haha, Yuuki is so shy around pretty girls. 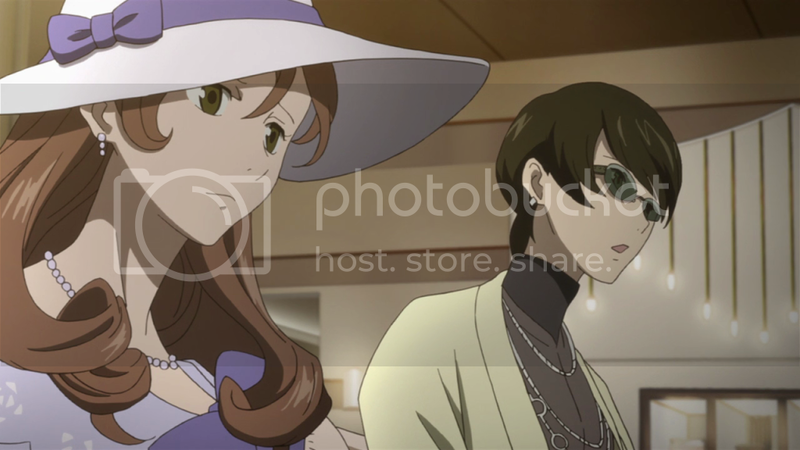 Yuuki and Inga are invited to the residence of the murder victim. Her daughter, Osada An, is a well rehearsed songstress who greets them with a song which Yuuki records because he likes her voice. She firmly believes that Aramaki is not the culprit. She knows that her mother visited a well reputed hotel monthly and requests Yuuki's help. She also briefly blurts out something about Yonagahime before realizing the issue was taboo. Panda Inga accepts, with expected flourish, on Yuuki's behalf. As they depart, Yuuki asks An if she wants to become a singer to which she responds that it has always been her dream. Inga looks so out of place. Yuuki makes his way over to the black market software distributer whom he intended to buy the Dol-pli song from in order to learn more about Yonagahime. The group is completely banned from circulation today and he was not in Japan during their peak years. The backstory here is the last piece of information you need to piece together the episodic mystery. Yonagahime was a idol group that received national acclaim during the war for the the cheery, patriotic pop songs they performed. The reason for their widespread fame is linked back to their debut. The group originally had four members but debuted with only three after losing one to the first terrorist attack on Japan. Their debut single featured all four girls making the deceased member, Anzai Eri, posthumously famous. They got the compassionate attention of an entire nation who cheered the three on with unconditional love. Following the end of the war, Yonagahime was forced to disband. Yuuki and Inga recognize the Eri's voice, which puts Inga in her creepy happy place. Even with her short hair, she looks like a girl to me. The duo then follow up with each of the living, now retired, members of Yonagahime and discover that they are not allowed to pursue solo careers in entertainment ever again. In their meeting with two of the members, Yumeno and Kumi, they learn that the victim met these two to give them money on a monthly basis. 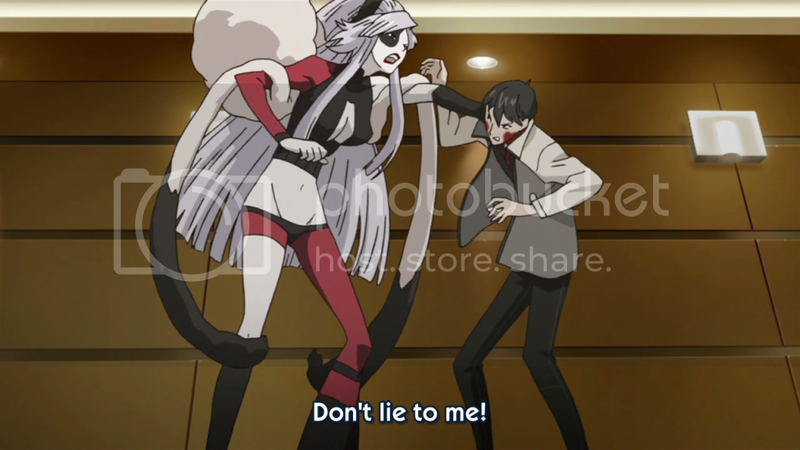 This episode it is Inga who throws around baseless accusations like "Hey, if you wore a disguise you'd look like a man. And see, you're a man woman team." She insinuates without proof that these two women are the culprits, making them the obvious plot decoy. (Women, they can be so annoying.) When Inga asks a question about Eri, Yumeno runs for the washroom crying. This excites Inga into chasing her. Her transformation is as glamourous as she is. 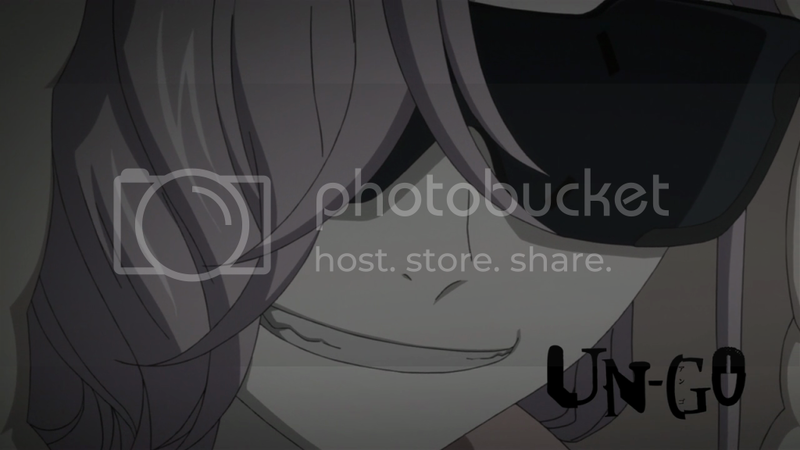 I like the onset of evil that occurs every time Inga has a revelation about truth. 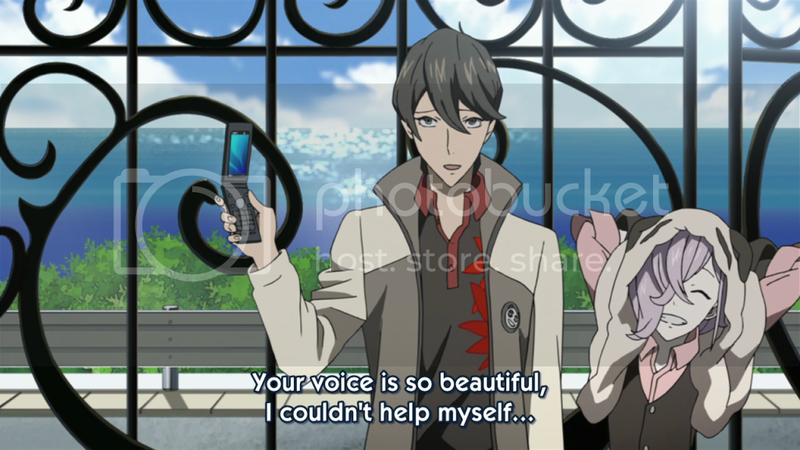 Before Yuuki confronts his suspect, he verifies Eri's with a voice recorded on his cellphone. Black market software distributors come with so many benefits. I'm not sure why the confrontation happens in a cemetery at Eri's grave. 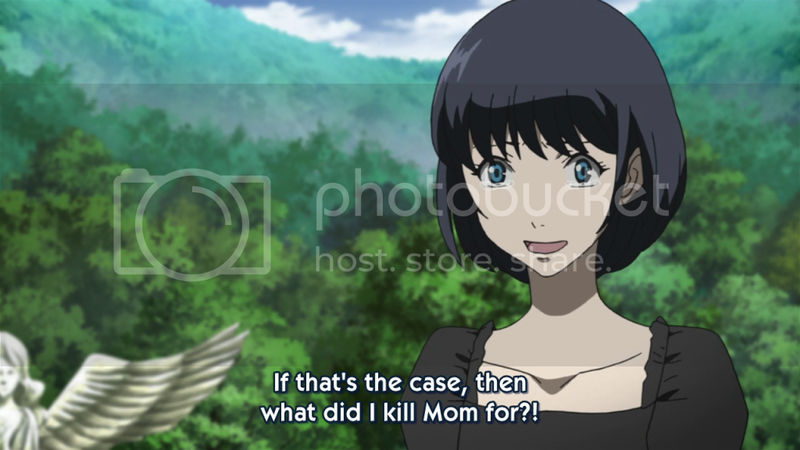 The murderer, Osada An, confesses to the crime she committed against her mother with an elaborate explanation of the story you have probably already pieced together. An's mother used her voice to create a fictitious fourth member for Yonagahime to boost their popularity. 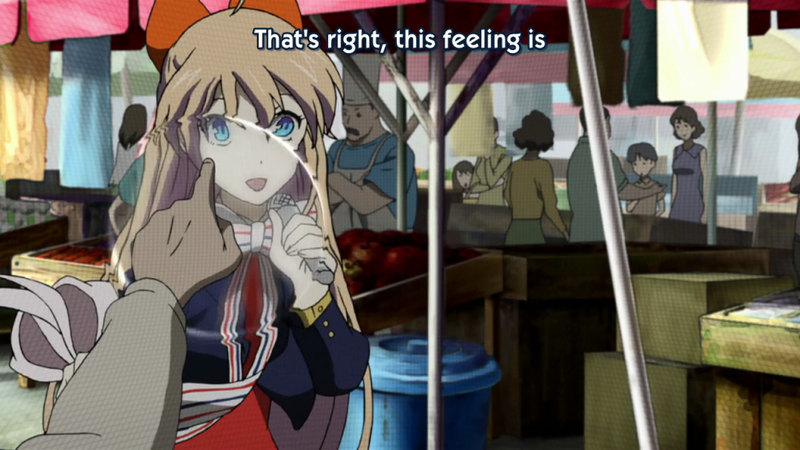 The ploy worked brilliantly but prevented An from realizing her childhood dream of being a signer. Why didn't you think things through first!? Did you ever stop to wonder why Yonogahime never performed again? This is where Koyama steps in to tell the three what the "reality" of the situation was. Aramaki, the murderer, was found dead because he committed suicide to escape prison. Osada An is still forbidden from singing under the New Internet Privacy and Protection Act, the same regulation which banned the circulation of Yonagahime's music. Yuuki, after a long philosophical rant about the fragility mankind and his continuous search to provide worth for his existence, accurately deduces that Kaisho Rinroku was the mastermind behind the "death of Anzai Eri"; the popularity of Yonagahime was his ploy to raise spirits during the war. Instead of denying his omniscience, Rinroku quietly listens to Yuuki while trying to terminate every upload and download of Yonagahime music from his super-terminal. Aaro: In the end, Rinroku was unable to stop every upload/download of this file. Leading up to this scene, the various shots of files being terminated with "illegal data detected" messages were interspersed with some of the downloads actually finishing. Rie, while watching a stream of news, got an email with the song as an attachment, showing how quickly the song had begun circulating. The final scene was of Rinroku leaning back with a coy smile on his face, obviously giving way to rampant proliferation of this particular song. What this means for his character is up in the air; he's obviously less "evil" and more "idealistic". My final thoughts...? I enjoyed Yuuki's character a lot more in this episode. He seem too flat and one dimensional in the opening episode. He shows a lot more emotion in this episode. I'm not sure if it's a one time occurrence (maybe because the mystery hit close to home somehow) or if he's going to be more engaging from this point on. Inga's eccentricity took some shape but still has little to no basis. She keeps getting weirder without any explanation as to why she is weird or why Yuuki tolerates her. 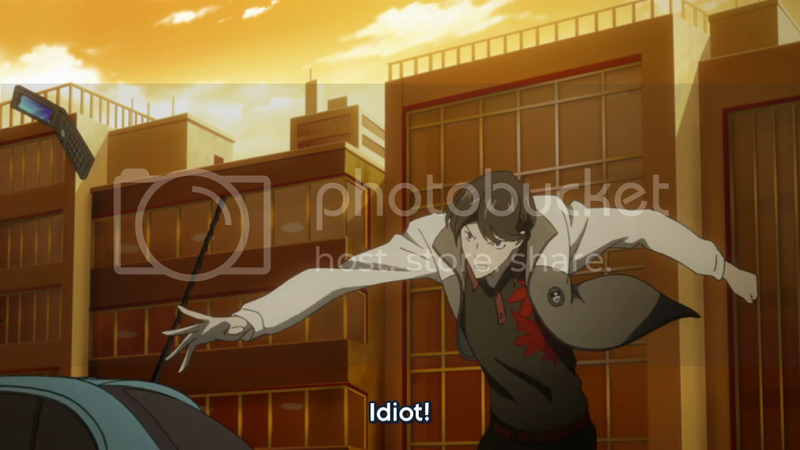 Rinroku's role in society is further clarified which piques my interest. All in all, Un-Go took a step up but is still hanging off the bottom rungs of the ladder. The preview for the next episode reminds me of a mini arc from Tantei Gakuen Q. We'll see how it pans out in seven days. Aaro: This episode allows this series to redeem itself a little bit more for me. The story (mystery of the week, actually) was well conceived, dealing with themes of propaganda, war crimes (i.e. propaganda being okay during the way but becoming taboo and banned after the war), and (slightly) the force of guided masses toppling a regime. These themes are pretty obviously very heavy for this kind of anime; it's giving me even more flashbacks of Gosick where serious themes were presented even with a light-hearted feel throughout most of the series. I hated the story-telling of this episode; that's a given, since I'm more interested in the story of this obviously character-driven anime. I dislike this show a little less, but I can't say that I like it and look forward to it unless I begin to like any of the characters first.